Fresh from her latest appearance on NBC’s “Today” show, internationally recognized author, speaker and educator, Michele Borba, Ed.D, joins our BCB podcast interview by Skype to describe her upcoming local talk to parents and other adults who care about teens. She will speak at the Commons of Bainbridge High School on Wednesday Nov 9th at 7:30pm — the evening after election day. The event is brought to you by the local Raising Resilience organization, and co-sponsored by the Bainbridge Island Healthy Youth Alliance. 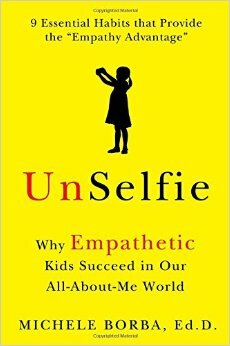 Michele Borba’s latest book is called “Unselfie: Why Empathetic Kids Succeed in an All-About-Me World,” which is available locally through Eagle Harbor Books. The topic of encouraging our kids to learn and practice empathy will be a significant part of her talk. That talk is a major event in the Healthy Youth Alliance’s 8-month educational campaign called “Beyond the Report Card: Cultivating What Matters”, which is designed for local parents and other adults who care about teens. That campaign just started and it’s not too late to participate at the Healthy Youth Alliance website. In this 13 minute podcast, Michele explains that empathy is a trait that any of us, and certainly teens, can learn and practice. As she says, empathy isn’t “just for girls”, and it isn’t something that you’re either born with … or not. Hosting this interview is local BCB volunteer Christina Hulet, herself a mother of two children, and Healthy Youth Alliance director Cezanne Allen MD. Cezanne explains the Healthy Youth Alliance’s current 8-month offering of events and readings that are designed to enable busy adults to learn effective ways of helping teens advance beyond the anxieties and pressures of their lives. Check out Cezanne’s BCB podcast introducing the campaign. To obtain a ticket for the Michele Borba talk, go to the Raising Resilience webpage. You’re welcome to click the following links to download free copies of her “Unselfie” discussion guide for parents, and her discussion guide for educators. Credits: BCB host: Christina Hulet; BCB audio editor and social media publisher: Barry Peters.